When most people think of a beach in Goa, they picture crowded shores and loud parties late into the wee hours. Take a trip off the beaten path and you'll find that Goa has much more to offer. Goa is increasingly getting famous with couples looking for honeymoon packages. 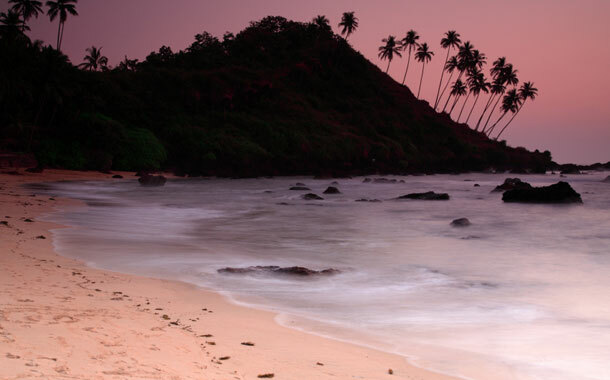 These hidden beaches in Goa will add more romance moments. Here are five of our must-see beaches where you can skip the crowd and have a good time. A short drive, but a whole world away from its busier neighbour Palolem, this beach is perfect for partying, but in peace. A wide beach with clean sand, clear waters with the right amount of surf, as well as a great selection of places to stay and eat, make Patnem a perfect beach. Remember to spend at least a day eating your way through the menu at Home, one of the finer restaurants in Goa. If you miss the bustle, you could always hop across to Palolem’s high street and sample some of South Goa’s best eateries. A flat, gorgeous stretch of sand that spans both beaches, this is a great way to discover some peace in the otherwise noisy north Goa. The raucous parties of Baga are a 30 minute drive away, but braving the crowds mean you’d be giving up a beach with heart warming swimming and heart stopping sunsets. Some of Goa’s finest restaurants are on this stretch - think La Plage - as are some stunning places to live at like Yab Yum. Why go elsewhere? Cola or Khola as it is now pronounced - is close to Agonda in the south of Goa. The fact that there aren’t really any signboards marking the way helps in keeping it crowd free. You may stay in beach huts or comfy tents and enjoy having dolphins for company as you swim in the clear waters. What's the best part? Phone connectivity is patchy in parts, which means you can celebrate with your friends instead of responding to messages. South Goa is blessed with an unbroken 22 kilometre long beach that changes names, and personalities, every few kilometres. One personality worth befriending is Uttorda, the beach just before bustling Majorda. The way to the beach winds through sleepy village roads lined with palm trees. The beach itself is no less beautiful. Powdery sands and gentle waves make it a great place to swim, sunbathe, and feast your way at Zeebop, South Goa’s yummier and quieter answer to Baga’s Britto’s. If you want to watch the sun set in style, do it in this northernmost bit of Goa. The beautiful fort of Tiracol has been converted into a luxury hotel that thankfully doesn’t have too many rooms. Perched on a hill, the hotel offers sweeping views of the sea below. Take a ferry and sail across the river to the shacks or hop on to a scooter and ride your way to the beaches nearby as the party fever hits you.You can also find budget & luxury hotels in Goa with offers and quality stay at low rates. Wish to go on a Goa Holiday soon? Get detailed information on our Goa Tour Packages here and Go Goa!